Cebuanos will be treated by a great day of music for one of the best balladeers of our time, David Pomeranz, will come to Cebu this February and will sing some of his popular hits in his Pre-Valentine Concert in Ayala Center Cebu. The concert will be on February 2, 2013 and will be held at the mall’s Activity Center at 6 PM. David Pomeranz is one of the most loved foreign acts here in Cebu and the rest of the Philippines. He has dozens of hits ans some songs became theme songs in various Philippine movies and teleserye. Some of his hit singles includes “Got to Believe in Magic”, “Born for You” , “On this Day”, and the Valentine favorite, “King and Queen of Hearts”. He also wrote the songs “Tryin’ to Get the Feeling Again” and “Old Songs” which were both recorded by Barry Manilow. His records have sold more than than 35 million copies worldwide. For those who want to see David Pomeranz in concert, all you have to do is present any 500 Pesos receipt from any Ayala Center store or a 1000 Pesos receipt from the supermarket. Only 200 choice seats are available so better shop now at Ayala center Cebu. Only receipts will dates January 24 to February 2, 2013 will be honored. No entrance fee or concert tickets will be sold for this Pre-Valentines concert. This is only a 1 night concert and should not be missed by David Pomeranz fans. This is also one of the best ways to spend an early Valentines date here in the Queen City of the South. 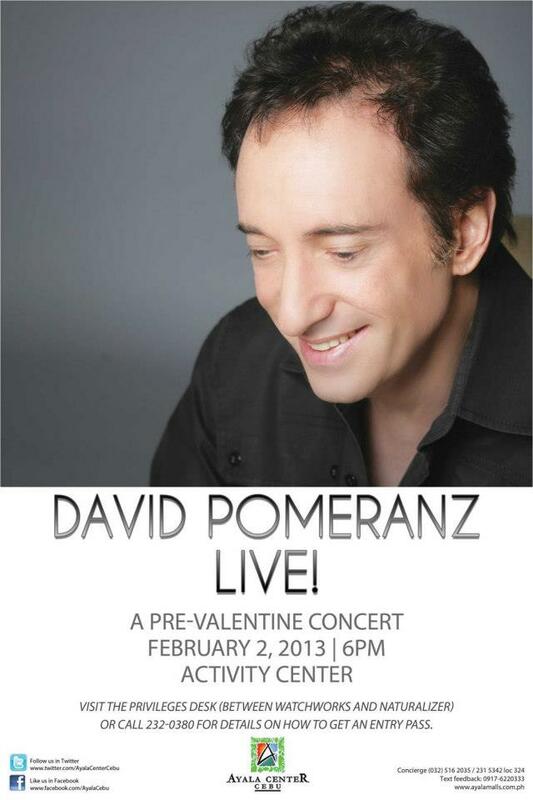 If you are looking for a Valentines concert that is truly worth remembering, better see this David Pomeranz concert together with your special someone!!! For more information about the David Pomeranz Cebu concert at Ayala Center, kindly call their concierge at (032) 516-2035 or (032) 231-342. To get the best current events and happenings in the Queen City of the South, please like our Facebook page at We LOVE CEBU!! !